Villa Sakos is situated on one of the finest beaches in the world, allowing you to wake up every morning to the spectacular sights and sounds of the Ionian Sea. Immerse the family in palace living with this multi-level, multi-functional executive estate. There is an elegant dining area just to the left of the living room which includes a wet bar. 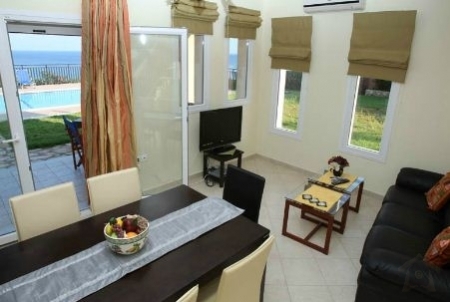 This beautiful three bedroom three bathroom rental villa is cost effective. The pool and spa are located to the back of the home for ultimate privacy. The media room is perfect for indoor fun. The office is your executive communication port to the world. 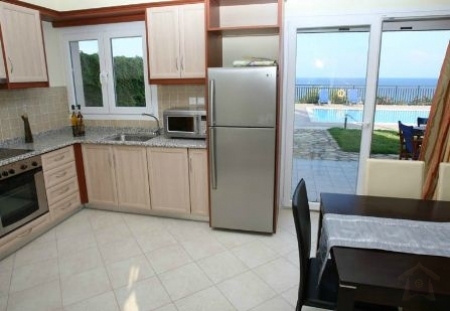 The fabulous kitchen is perfect for the family chef who wishes to entertain guests on vacation. This estate will not disappoint the most avid traveler. Few moments can surpass the gorgeous location and iconic views of humpback whales, spinner dolphins and the surf of Ionian Sea. This villa is perfect for the largest of families with passions in golf, snorkeling and surfing. Villa Sakos vacation rental rates $1200 per week. Rates are subject to change without notice. This truly is an outstanding villa designed to meet your every vacation needs. 30% deposit upon booking in order to confirm reservation. Full balance 56 days prior to arrival. 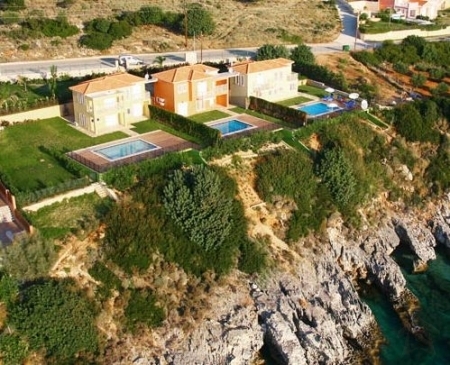 Refundable breakage deposit 150 euros per villa. 56 days or more before the arrival date, an administration fee of 10% of the deposit will be held. The rest will be refunded. 20-8 days before the arrival date, 50% of the total amount will be held as a cancellation fee. 7-0 days before the arrival date, the total amount will be held as a cancellation fee. Refunds will be sent only to the Credit Card holder's name.